4th birthday wishes can be tricky — since 4 year olds are neither babies nor big kids. Here, nothing’s tricky. It's easy to find the right birthday messages for your 4-year-old birthday boy or girl. 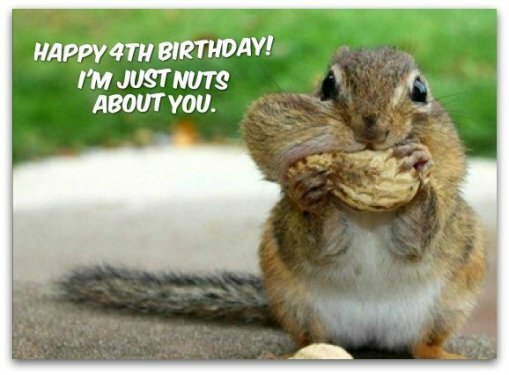 All the 4th birthday greetings on this page have all the ingredients the Moms and Dads of 4 year olds look for: just the right amount of humor, joy, wonder and innocence any 4-year-old boy or girl can relate to. ...Like my Grade 4 teacher always used to say, "when you cheat, you're really cheating nobody but yourself." The same applies to birthday messages. When you take the easy way out and choose any birthday greeting, you're not only cheating the birthday boy or girl out of a heartfelt message — you're also cheating yourself out of the gratification that comes from choosing a birthday wish that truly expresses your feelings. To me, that's the one of the greatest things about birthday messages: they give you a chance to show you care. First, you should think about what you want to say to the parents of the 4-year-old birthday girl or boy (since, as I mentioned above, he or she probably can't read very well or at all). Second, remember that this bundle of joy is not an infant anymore and is fast becoming a little person with more depth than you might think. With these two thoughts in mind, it will be slightly easier to pick the right 4th birthday wishes. There are, of course, different types of 4 year olds, so what's the best approach to take? It may help to keep in mind what 4 year olds need to know about themselves and the world. According to Alicia Bayer, blogger and the creator of magicalchildhood.com, your typical 4 year old "should know that the world is magical and that so is she. She should know that she's wonderful, brilliant, creative, compassionate and marvelous. She should know that it's just as worthy to spend the day outside making daisy chains, mud pies and fairy houses as it is to practice phonics. Scratch that — way more worthy." This is from Alicia Bayer's article, What Should A 4-Year-Old Know?, which is on Huffingtonpost.com. You can read the entire article right here. 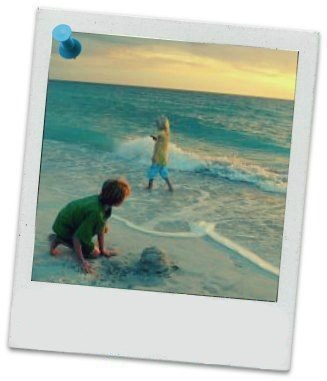 What Alicia Bayer wants us to know (and what you should see in a birthday message) is that 4 year olds need to hear that they are wonderful, brilliant, creative, compassionate and marvelous. Hoping this year’s birthday is the very best a super 4 year old — like you — can ever have! Happy 4th birthday! Hoping your birthday cake is four times bigger than the biggest cake in the world. That’s the only way to celebrate the birthday of my favorite 4 year old in the world. Happy 4th birthday! You should have four of the world’s brightest candles to blow out — because you've made the world a much brighter place to live for four whole years. Happy 4th birthday! Happy 4th birthday. Now you are four times as beautiful as you were at birth. The number "4" is magical. Know why? Because you're 4 years old today. Happy 4th birthday, sweetheart. All three 4th birthday wishes below are my top picks because it makes turning 4 such a glorious celebration. After all, how many other times in the life of a child can a kid just have fun, without worrying about the consequences? Not many. This birthday wish gives your 4-year-old birthday girl or boy the permission to be, well, 4. Rule #1: All 4 year olds to have fun on their birthday...and every other day of the year. Rule #2: Do not break Rule #1. Happy 4th birthday! It's time to find out how many pieces of birthday cake you must eat before you can call yourself a true 4 year old. Happy 4th birthday! For the next 12 months, you get to be the greatest thing in the world…4 years old. Make sure you enjoy every one of the next 365 days! Jump in puddles, get messy, spill milk, have fun! Happy 4th birthday! For each of your four birthday candles on your birthday cake, I grant you a birthday wish. Hoping all four of your birthday wishes come true. Happy 4th birthday! This is your special day. Every second today is for you. After all, it’s your birthday, so let’s hear you roar, I’m 4, I’m 4 and I’m 3 no more! Happy 4th birthday! You are 4. 4 is fun. 4 is fantastic. 4 is fab. 4 is freaky. But 4 goes fast, so you should really adore 4! Happy 4th birthday! Break out the boom, boom, boom, boom. Let’s zoom, zoom, zoom, zoom! Because it’s time to celebrate a very special birthday…Yours. Happy 4th birthday to my favorite four year old! At 4 years old, you turn into a magical wizard. Not really, but you’re magical to me. Happy birthday to the cutest 4 year old I know and love! You're 4 years old today and I only have four things to say to you: Happy 4th birthday, sweetie! Your birthday candles are four times brighter this year. Your cake is four times bigger. It’s a good thing…because somebody who is four times more special than everyone else is 4 years old today. That special someone is YOU! Happy 4th birthday! 1, 2, 3, 4, may your 4th birthday be better than any birthday before. Happy 4th birthday, my precious, I’ve loved you since you were born! 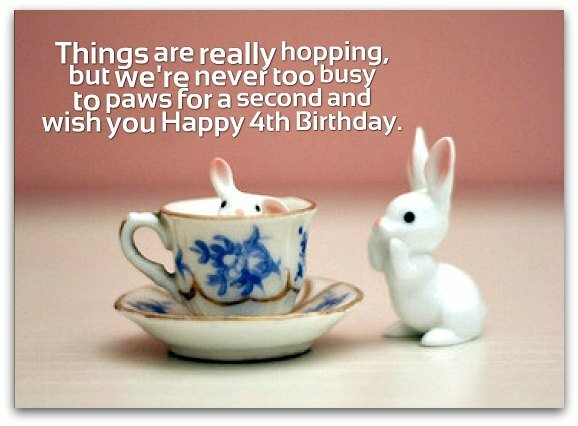 Today is your 4th birthday, so you get to make four birthday wishes. I hope every single one comes true. Happy 4th birthday! When your friends tell you that turning four is super duper, you tell them it’s actually super, super, super, super duper! Happy 4th birthday! When you turn 4 years old, you have a special job to do. All 4 year olds must do it. No 4 years old can get out of doing it. At 4, your job is to be happy and have fun, starting with your birthday party! Happy 4th birthday! Wow, you’re 4. Before you know it, you’re going to be old…you know, 5 years old. Better have fun while you’re 4. Happy 4th birthday!